Pregnancy number 2, seemingly going smooth, but in reality I was literally and figuratively getting too big for my britches. Afterwards, since I clearly considered myself an expert on the topic (present-tense me groans loudly at past-tense me), I figured the second pregnant winter would be about the same. Which is how I entered last winter optimistically, four months pregnant in late January with high expectations to ski until at least March, only to tear my patellar tendon while filming for a much-anticipated project and cut my season short. I will spare you the details of what this felt like, and say only that I knew I had done it because I had done the same injury to my other knee 6 years earlier. My husband said “I knew you did the same thing because your yell afterwards sounded exactly the same!” It was one of those windblown powder days when there was lots of soft, until there wasn’t, and I found one of the rock hard spots. The irony of this injury was not at all lost on me—here I was “the expert,” and I had done exactly what I did not want to do. If I go back and look at my own tips, I can very obviously see that I wasn’t following my own advice on many levels (see tips number 1-10 out of 10). You know what they say, don’t let the belly get in the way of seeing the snakes in the path. Or something like that. **not a rattlesnake, FYI, although I damn near reinjured my knee on this mellow recovery walk because when we first saw it you better believe we thought it was a rattler! The physical pain of this injury was immense, but emotionally I was devastated. Yes, the baby was fine but now I needed surgery, which could risk harming my baby. I was so angry at myself. I channeled my anger into research, looking at all of my possible options. I talked to my midwife, two anesthesiologists, and my surgeon. I looked up countless briefs and studies and articles online. As it happens, there aren’t that many cases of pregnant women getting patellar tendon repair. Like, zero that I could find. I decided reluctantly that immediate surgery with the least amount of medications possible would be the best course of action. Sitting here today, over a year later, with a healthy happy baby sleeping in the other room, and a knee that grows stronger each week, I feel incredibly grateful. Yes, it was lame, and yes I wish things might have happened differently, but I was very lucky and I learned a lot. In hindsight my mistakes were obvious; at the time I was only paying attention to what I wanted to see. I wanted to share all of this not to advise others this time, but to tell my full story about skiing pregnant, to give both sides of the coin as I’ve experienced them. And the beauty of it is that we each get to make our own individual choices, each step of the way. 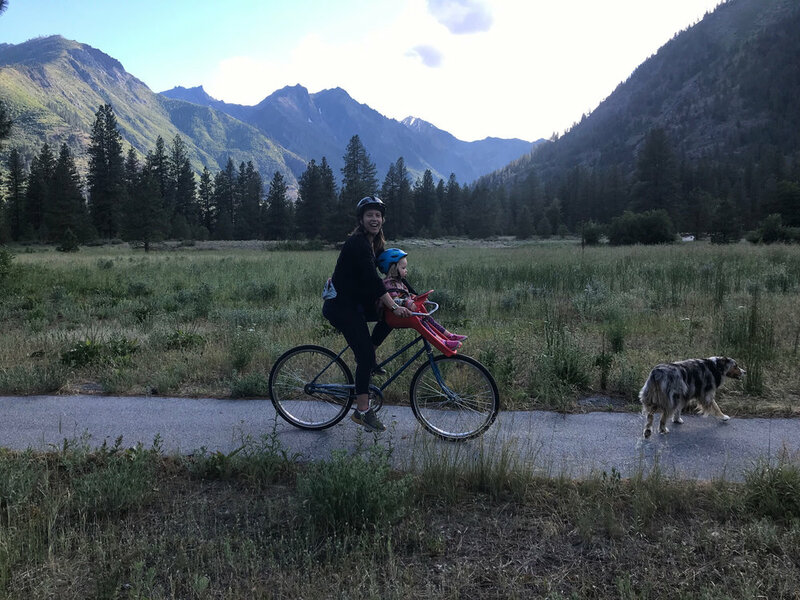 Family cruiser biking with a growing belly and healing knee was definitely the best. Yes, different than skiing blower powder, but equally important. Sometimes things in life happen that force a pace change (see photo above, re: hiking with toddler), and it can be just the most needed thing. Not what I wanted, maybe, but what I needed.